With less than a day to go until Microsoft kicks off its hotly-anticipated Windows 10 event, it looks like the interwebs are being flooded with bits information regarding the Microsoft Lumia 950 and Lumia 950 XL, the company's upcoming Windows 10 Mobile flagship smartphones. Unlike the usual hardware-based rumors and leaks, this time around we're here to report on a rather interesting choice that Microsoft has allegedly made with regard to the apps that come pre-installed on the two phones. According to a new rumor, the Microsoft Lumia 950 and the Lumia 950 XL will both come with Candy Crush Saga pre-installed. The source couldn't say if the game will be pre-installed on all of the various market-specific variants of the two phones, but the international versions of the handsets are said to come with the game out of the box. Fortunately for those who aren't into Candy Crush, users will allegedly be able to uninstall the game from their handset. 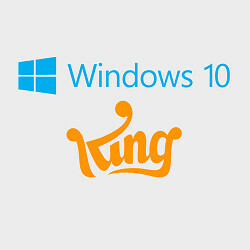 Back in May, Microsoft announced that King's Candy Crush Saga will be ported to Windows 10 Mobile, and even bundled the game with the preview version of the OS for a limited time. Microsoft's decision to pre-install the game, one of the most popular titles in mobile gaming history, can be interpreted a sign of the work that has been done to minimize the app gap between Windows Mobile and the two leading mobile platforms, Android and iOS. Lol. This is funny coming from the company that promotes productivity. I can already see business people wasting time playing this game during office hours. No, offense to those who already do. You forget the og windows desktop had games built right in. It was a design feature to get people used to the mouse. Games are fine but Candy Crush Saga? Really? Am I the only one that: 1) Never ever played Candy Crush? 2) Sees a better future for games on the win platform? No, you are not alone. I never played candy crush and hate it badly. Also hate those ppl who play it. It looks like a kids game. I have a half day salary deduction policy in my office if found anyone playing game during working hous. Only browsing, facebook or whatapps is allowed in free time. Only browsing, Facebook and Whatsapp allowed in FREE time. Whatever I do in my free time, is my business. What I do during working hours, that's another thing and using that time for Facebook and Whatsapp should be punishable as well (if used excessively). So if I want to play f**king candy crush on my break, that's my choice and some lame policy can't do a thing about it. Ps if you hate people that play a stupid mobile game, you need to get a life. Then your job blows. No job will tell me what to do on my free time unless I am breaking internal policy etc in regards to privacy and other sensitive COMPANY information. I highly doubt candy crush is company information. Candy Crush and any of those games are as much fun as dragging your balls across sandpaper dosed in vinegar.. Pretty much everything can be uninstalled on Windows 10 Mobile though. Carriers usually add some apps, but they've always been removable. .... Can it be uninstalled? Of course, unlike android, blackberry and ios you can uninstall apps that come with the mobile. Candy crush is easily the best phone game, it's got stupid childish graphics but the core game play is brilliant. I'm not sure why they would prefer install it though. Odd. Yes, let's install the old version of the game while the soda one, which is actually new, is still unavailable. Which you will find out after trying to find it in the store. Seriously, why do this??? Well windows has minesweeper and solitaire installed before so I guess Candy Crush is the new solitaire. Blackberry installed word mole and that pong type ridiculously hard paddle game. Well I'm now pissed off. What an important piece of news. wow what a selling feature! Well that's just did it. I now have 0 interest in this phone now. Nah it was a joke my friend. I am interested in this device. When will they update Lumia 930 to Windows 10 monile?? Yes, the 930 will be upgraded to Windows 10 Mobile. Can't beat Apple when it comes to bloatware!